Added by Bobe on 04 December 2009. Does anybody know why Northamptonshire would need such a vehicle? Added by Simon Gunning on 04 December 2009. In the forces these are know as BV's as Bobe says they are used in the falklands by the RAF, my son was posted there a number of years ago and had to do a course up in Yorkshire before hand. Added by Dave Price on 05 December 2009. Simon, I think you ask a very relevant question there! The bits of Northampton I know hardly warrant this. Is it another case of "lets be first"! I only hope its on trial and doesn't cost the ratepayer, the price of these gimmicks in a county brigade cant be justified. Added by John Stott on 05 December 2009. Why does it have a 'Q' plate? Added by Yelp Bullhorn on 05 December 2009. Added by Barrie Green on 05 December 2009. Its owned by a private company in Cambridgeshire who are experts in water rescue, they have an agreement with both Northamptonshire and Cambridgeshire to assist both these brigades in water rescue incidents, they are for use in heavy floods. Hope this is of help. Not sure of the company name but know they also assist police forces in these areas. Added by Richard Whiting on 05 December 2009. Does Northampron have any hilly or high woodland or roughland areas?. Added by Stevie Murray on 05 December 2009. Thanks Richard, thats cleared that up. Added by John Stott on 06 December 2009. Cant remember the name of the company, anyone else shed a light on there name?. Added by Richard Whiting on 06 December 2009. Richard, well if you look to the right of the main photo above, the guys at fire-engine-photos.com reckon they're made by Hagglund. Added by Yelp Bullhorn on 07 December 2009. Yelp, I think Richard is refering to the name of the company who operates this vehicle, not the name of the manufacturer. However you are correct that Hugglund do manufacturer these. This one would have see service with the armed forces until it was disposed of. Reference your last question, there could be several resons why it has been issued a Q registration. Added by Simon Gunning on 07 December 2009.
this isn't northamptons, it is owned by a private company within northampton that have a license to use our livery and name. Added by Jake Fisher on 01 May 2010. As far as I can remember , the name of the company that owns this machine is U.K.O.S. ( United Kingdom Operational Support ) and they are based on the former RAF base at Alconbury in Cambridgeshire . See my photo of it in its original paintwork at Northants workshops . 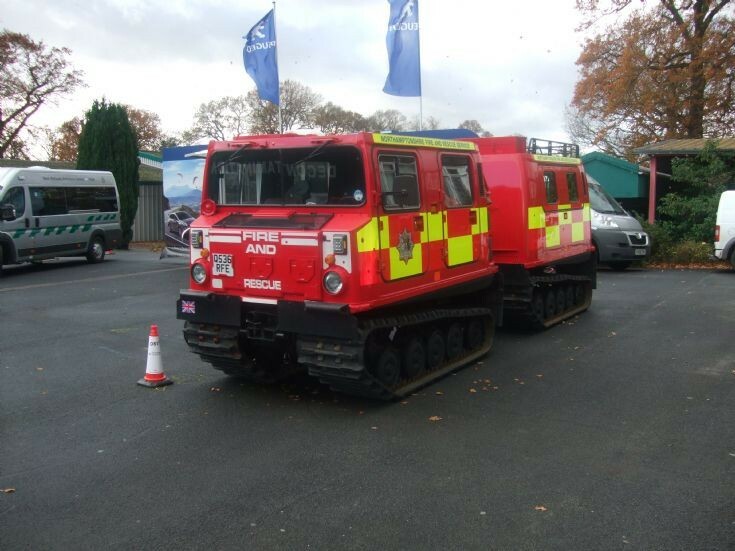 Added by Graham Nobes on 25 September 2011.
just some info on this vehicle, it is a BV 206 it can have 4 crew in the front cab and up to eight in the back cab.it is very good in the snow and most off road tracks. Added by Mark Whiteley on 11 October 2011.